PDA - Italian Dine & Drinks - CHOMP! SLURRP! BURP! 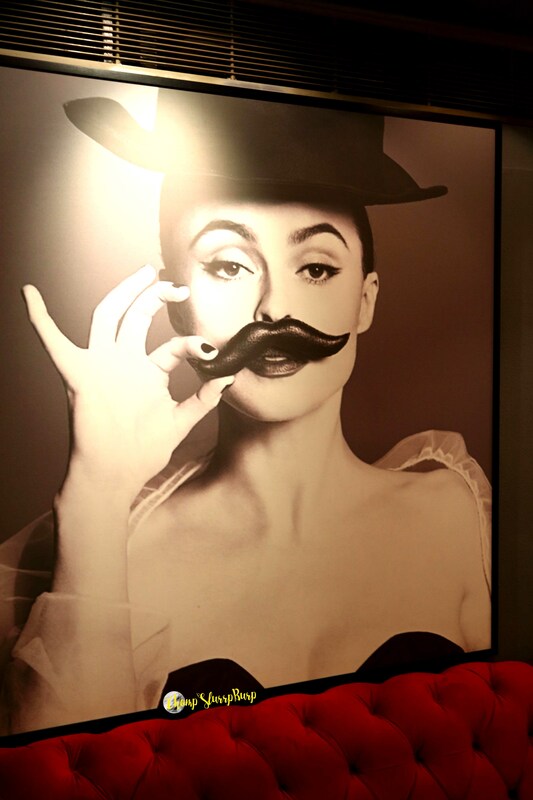 PDA is one place class apart, the people behind PassCodeOnly have opened this in GK with a mindset to prepare authentic Italian delicacies complementing the fine dining outlet “Diva” and in association with them. 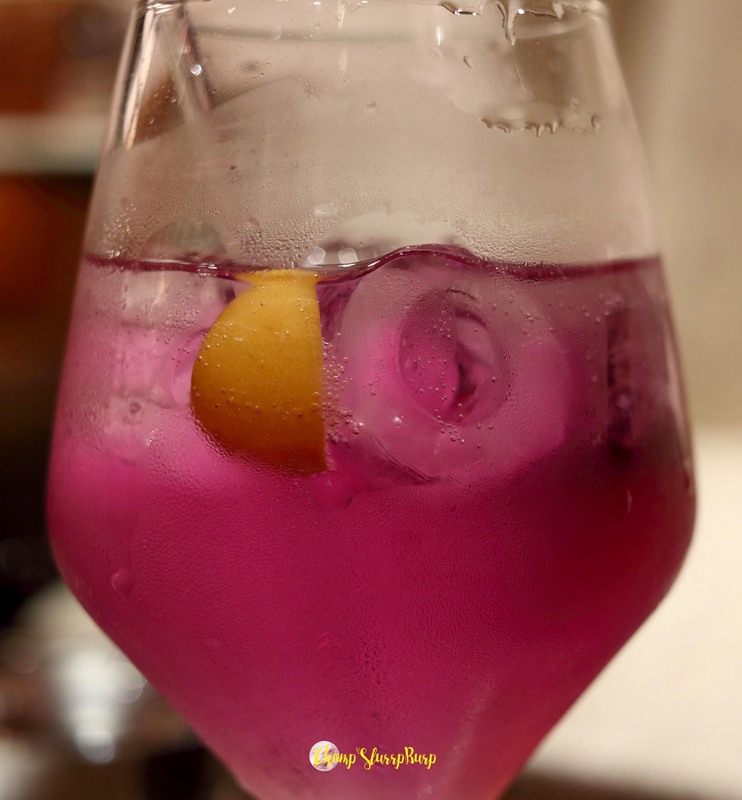 Celebrating the Gin festival, mixologist Vikas prepared some really experimental concoctions with flower infusions. The chic interiors and the martini bar invites you to a classy evening with some lip-smacking food. 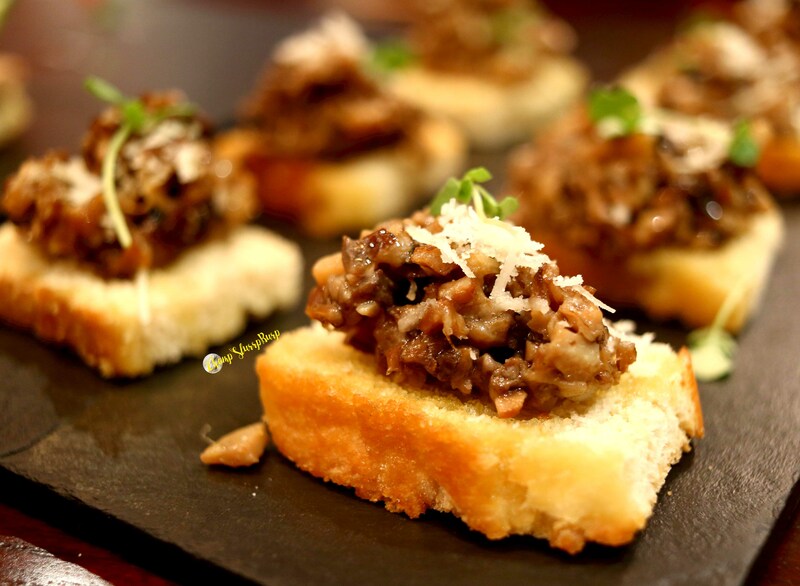 We started off with Wild Mushroom & Parmesan Bruschetta, a classic bruschetta bread with cut mushrooms light dressing and a bit of parmesan. The quantity of parmesan could be increased but otherwise a great preparation. 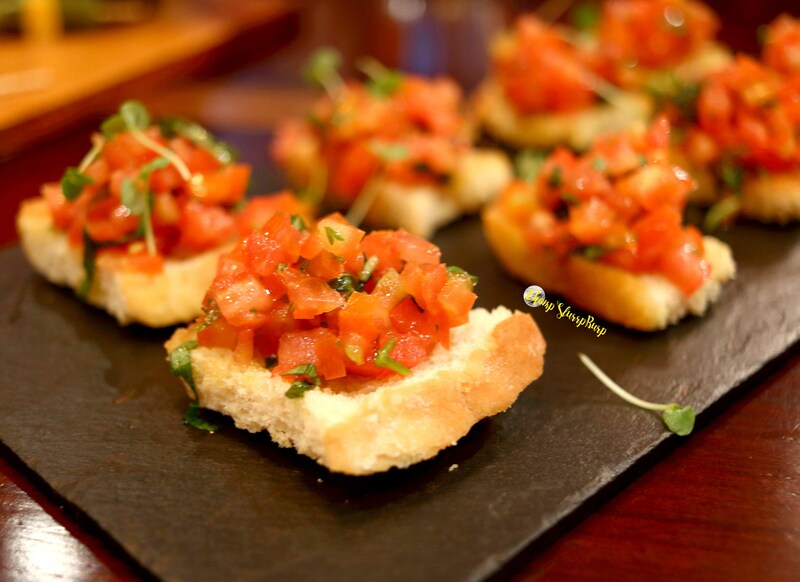 The tomato and basil bruschetta is a classic, diced tomatoes with basil provide the perfect combination of flavors. We tried the new Gin introductions, the G&T which is a twist on the classic Gin and Tonic and the Pear me Up. 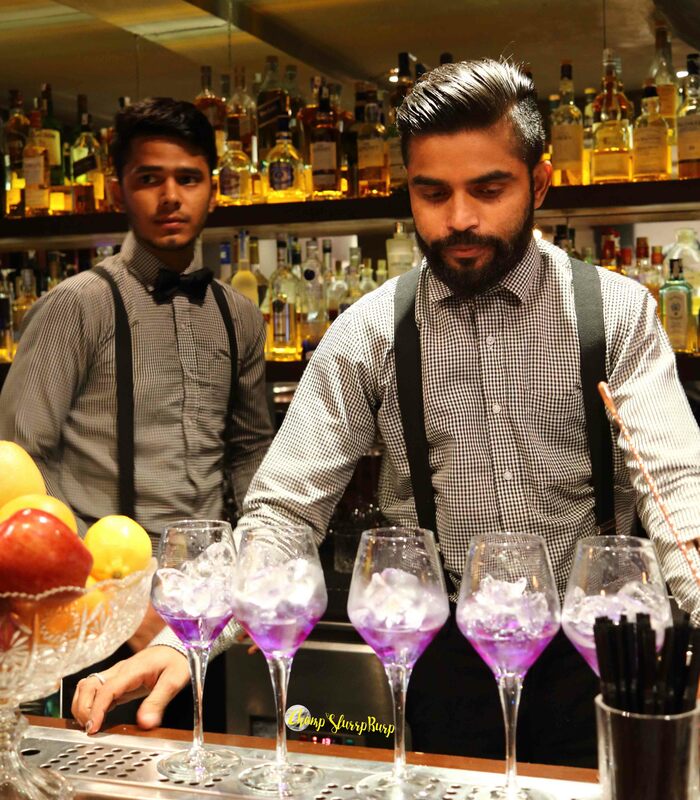 The G&T was introduced as a magic drink by Vikas changing its color with the pour of tonic after adding some citrus, worthy of a try. The Pear Me up is another experimental drink but didn’t fascinate me much. 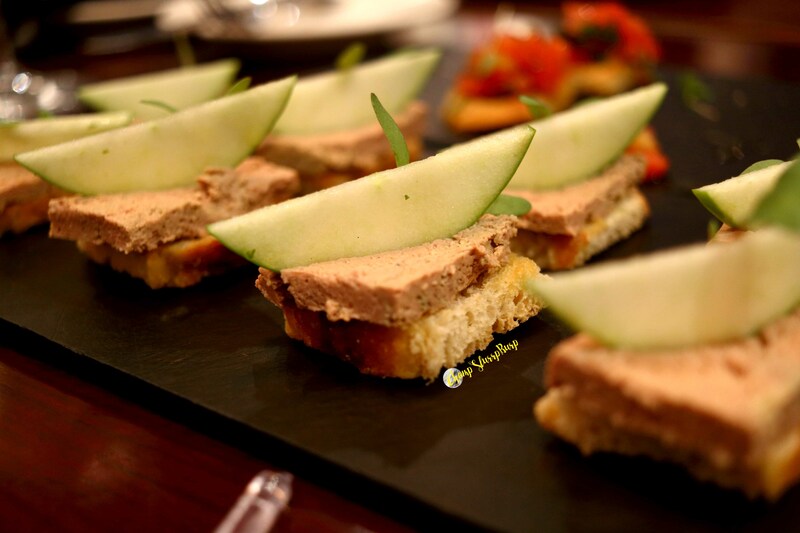 The chicken Liver Pate was my favorite, very light liver served in a form of a pate, which is basically a mixture of ground meat and fat, with an apple slice on top which essentially cuts down the bitterness of the liver. The Pizza isn’t the classic thin crust, Rustic base quite crispy topped with cherry tomatoes, olives, pesto and generous mozzarella. Next up was the Focaccia in a Tin, Parma Ham and Salsa Rosa topped freshly baked focaccia bread with the freshest of ingredients and the purest of flavors. There was the vegetarian version also with Stracciatella cheese and cherry tomato. Another drool worthy preparation. Baked Phyllo Cups were up next, which weren’t very alluring nor drool worthy, it was just served as a gratis and aren’t recommended. The chicken Skewer was the last and the best, tender chicken on wooden skewers served with a ambrosial dip, the dip is what made the sesame crusted skewers stand out and delicious. PDA, PCO Diva Agenzia should be on your go to list if you want some fine Italian delicacies and great cocktails, little expensive though.